Authorities seize enough fentanyl for "1 million overdoses"
MASTIC BEACH, N.Y. -- Authorities on Long Island announced on Saturday the seizure of 750 grams of fentanyl from a home in Mastic Beach, CBS New York reports. Does Trump's action on opioid crisis go far enough? "That's potentially enough fentanyl to kill hundreds of thousands of individuals," he said. Sini, who's running for Suffolk County District Attorney, said his department worked with the Department of Homeland Security, Customs and Border Patrol, and the US Postal Service. 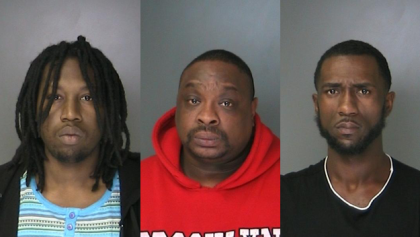 Three men men were arrested at the home, including 24-year-old Corey Robinson, who was charged with criminal possession of a controlled substance. Also arrested were 41-year-old Thomas Moore and 25-year-old Daequane Rickenbacker. Police said Moore had a pit bull on a leash in the front yard when officers arrived. He allegedly ignored the officers' commands and released the dog, which charged at them. The dog was shot and treated at a local animal hospital. Moore was charged with obstructing government administration, while Rickenbacker was charged with loitering. Meanwhile, the federal government is sending law enforcement teams to cities in five states to help stop the flow of heroin and synthetic opioids. The U.S. Drug Enforcement Administration said Friday the teams will enhance the agency's ability to combat problems surrounding heroin, fentanyl and drug trafficking violence. The DEA is sending teams to Cincinnati and Cleveland; Long Island; Raleigh, North Carolina; New Bedford, Massachusetts; and Charleston, West Virginia. The agency considered fatal overdose rates, levels of heroin and fentanyl seizures, and where extra resources would have the greatest impact in selecting cities. U.S. Attorney General Jeff Sessions said in August that he was dispatching 12 federal prosecutors to cities ravaged by addiction. Those prosecutors will focus exclusively on investigating health care fraud and opioid scams.